In a food processor, pulse nuts till they become a fine powder. Add remaining ingredients to the food processor and combine until dough begins to clump. 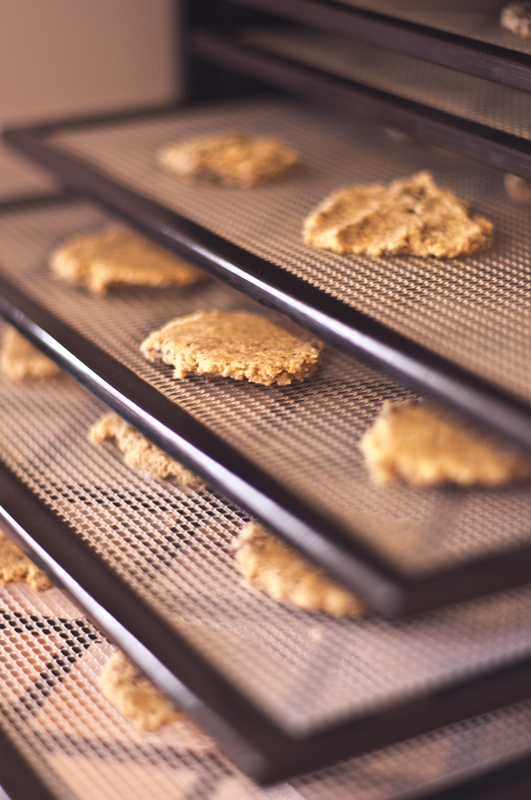 On your dehydrator sheets, spoon cookie dough onto sheets and pat down till the cookie is 0.5 to 1 cm thick. Set dehydrator to 110 F for 32 hours. Preheat oven to 350F. Spray non-stick spray onto a mini muffin tin (should hold 32 mini muffins). In a large mixing bowl combine all wet ingredients (flax egg, apple cider vinegar, soy milk, pumpkin, vanilla, olive oil, cane sugar). Fold your dry ingredients( flour, baking powder, salt, cinnamon, nutmeg, ginger) into your wet ingredients. 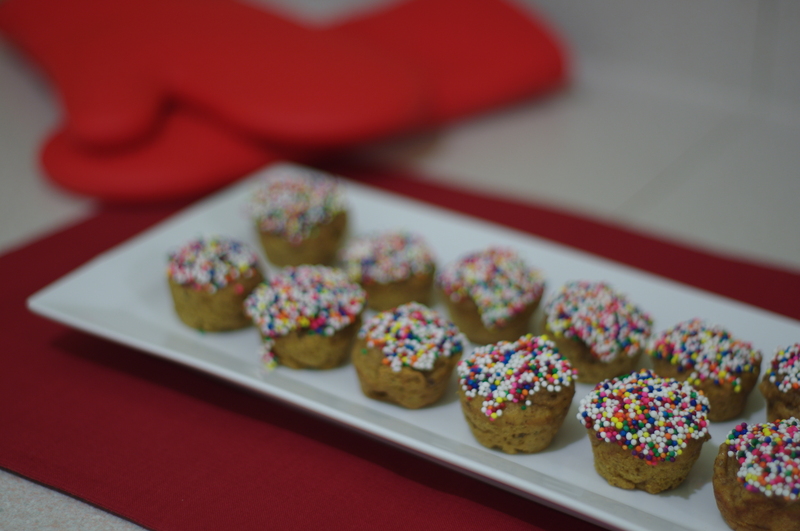 Once fully combined, scoop mixture 1 tbsp at a time into your mini muffin tin. Bake for 10-15 minutes or until a knife inserted through the center or a doughnut comes out clean. To make icing: combine all three ingredients. You may need to add more icing sugar or pumpkin in order to get an icing like consistency. Store in fridge over night. In the morning, dip doughnut into icing then into sprinkles. Repeat for every doughnut. Enjoy with a hot cup of coffee or cleansing green tea! Per heat oven to 350F. 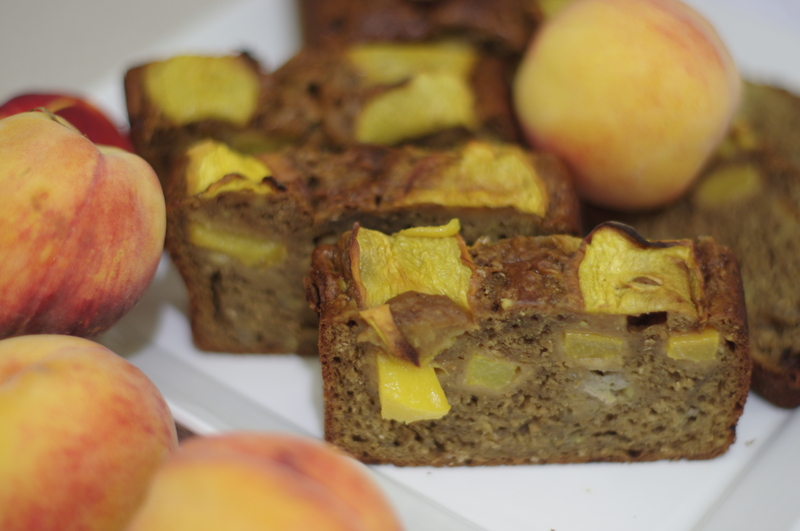 In a large mixing bowl, combine mashed bananas, pureed peaches, olive oil, sugar and molasses. Fold your flours, baking powder, cinnamon, nutmeg and salt into your wet mixture (banana mixture). Oil a 9×5 inch loaf pan. Pour your dough into the pan. Bake bread for 1 hour +/- 10minutes. The top should be lightly browned and a knife inserted through the center should come out clean. Scone: In a large mixing bowl, combine all scone ingredients. Once formed into a sticky ball of dough, transfer to a well floured counter surface. Using a rolling pin, roll dough out till it is 1/2 inch thick. Using a circular cookie cutter (I used a cup), cut dough with cookie cutter and place onto a cookie sheet, these are now your scones. Continue to form and roll out dough until you have used up all your dough. Dip scones into melted butter and place back on cookie sheet. Make an indent in each scone using your fingers. 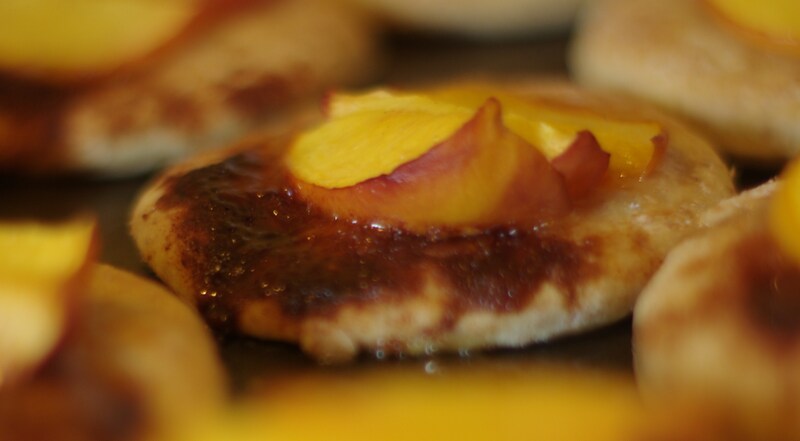 Place a teaspoon of jam into each indent and top with 3 slices of peach. Repeat for all scones. Dust each scone with cinnamon. Place scones in oven at 350F for 12-15 minutes or until slightly brown. Combine ground flax and water; set aside for 10 minutes. Combine all dry ingredients in a large bowl and mix. Add all wet ingredients to dry and mix well. Finally add flax mixture. If final mixture is too watery add more quinoa or bran flakes, if too dry add more nutmilk. In a large skillet, heat coconut oil on medium-high heat for 2 minutes. Pour pancake mixture onto oiled skillet using a 1/3 cup measuring cup. Cook on one side for 3 minutes, flip and cook on other side for 3 minutes or until pancake is firm. 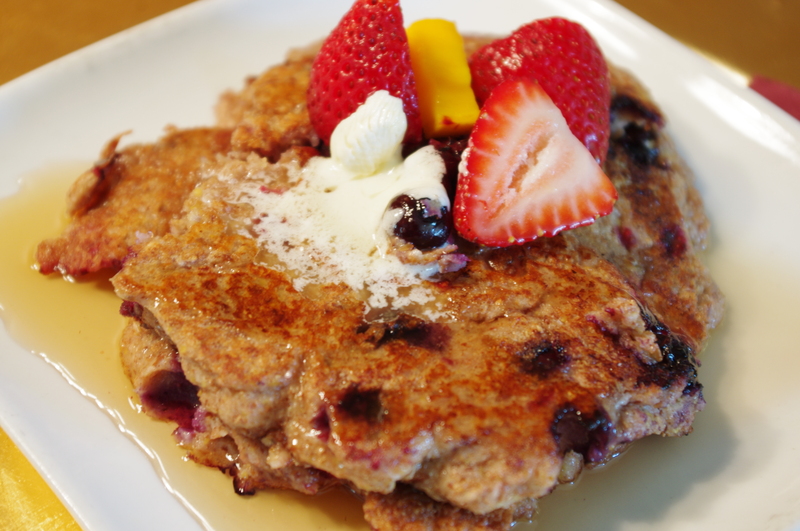 Serve with slice fruit, Canadian maple syrup, earth balance vegan butter and a smile! In a VitaMix blender or food processor, combine all ingredients except coconut. Make sure to blend on a low setting. You want the mixture to be the same consistency of ice cream. If you need to add more soy milk, feel free to do so. 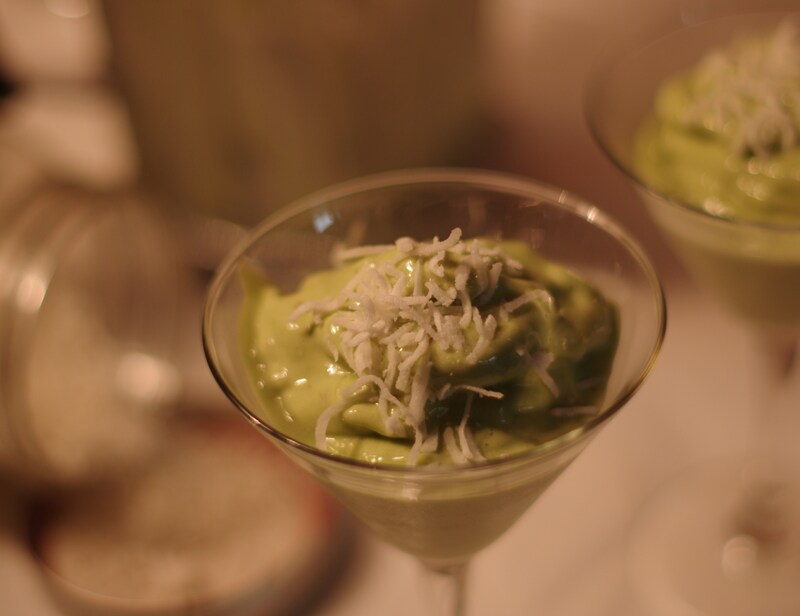 Scoop into bowl and garnish with coconut. Consume immediately. In a high speed blender or food processor, grind the soaked almonds and spelt until the mixture is that of flour like consistency. 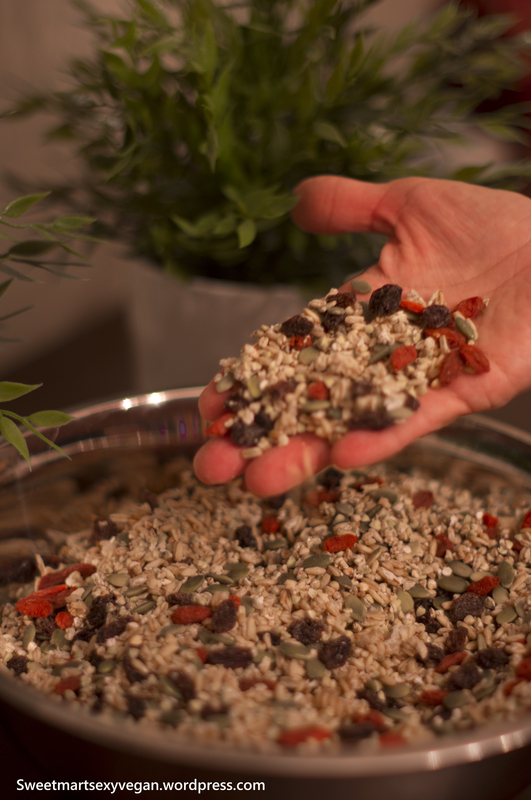 In a large mixing bowl, pour the blended mixture in and add all remaining ingredients except the goji berries. 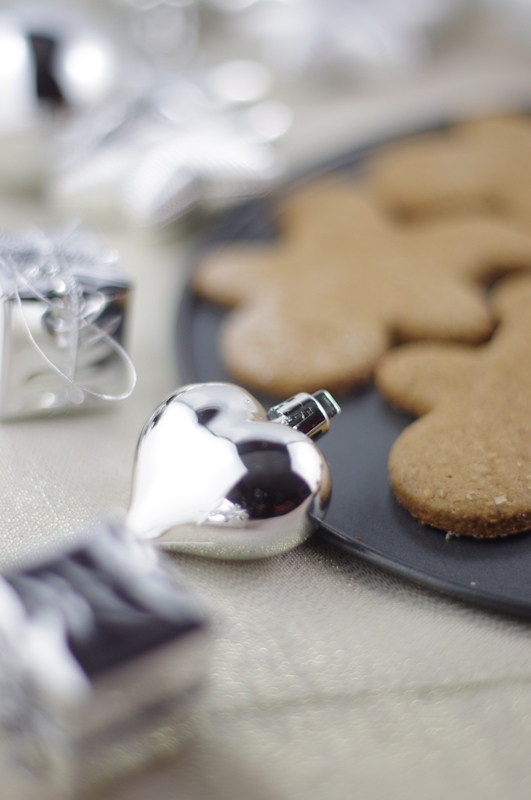 Using a cookie cutter or your hands, form dough into heart shapes and place on a dehydrator sheet (no need for paraflex sheets, your dough should be thick enough to sit on a standard dehydrator sheet). 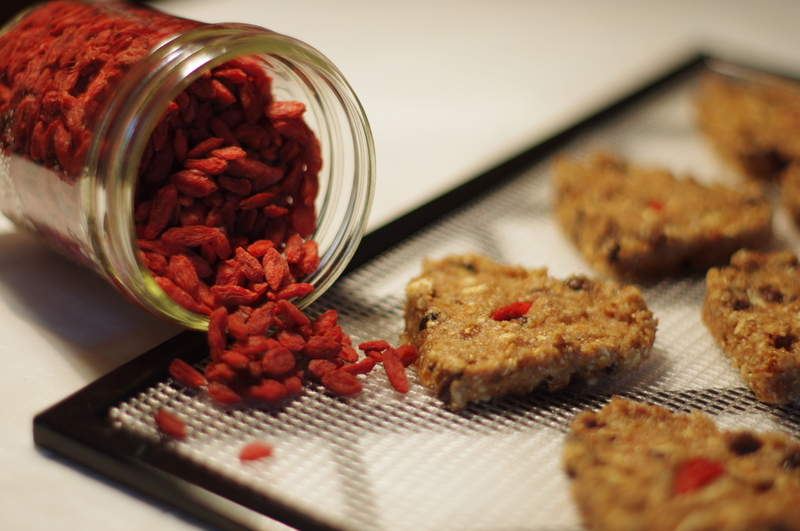 Once all dough has been used, place one or two goji berries on top of each cookie and press firmly into cookie. Dehydrate cookies for 4-5 hours or until they have a chewy on the inside, firm on the outside texture. 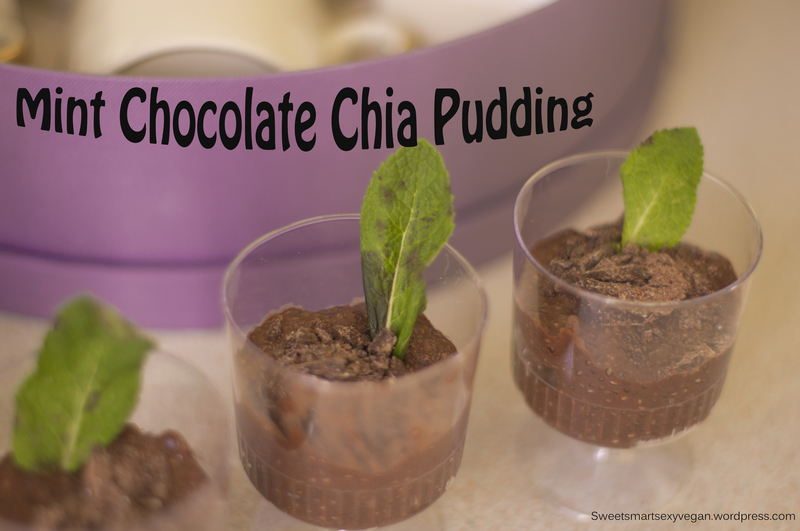 Serve with a cup of tea or homemade nut milk. Combine all crust ingredients in a food processor or high speed blender. Blend until consistent crumb mixture forms. Spread crust mixture on the bottom of a small spring cake pan. Press crumb mixture firmly down. Set aside when making the cream. 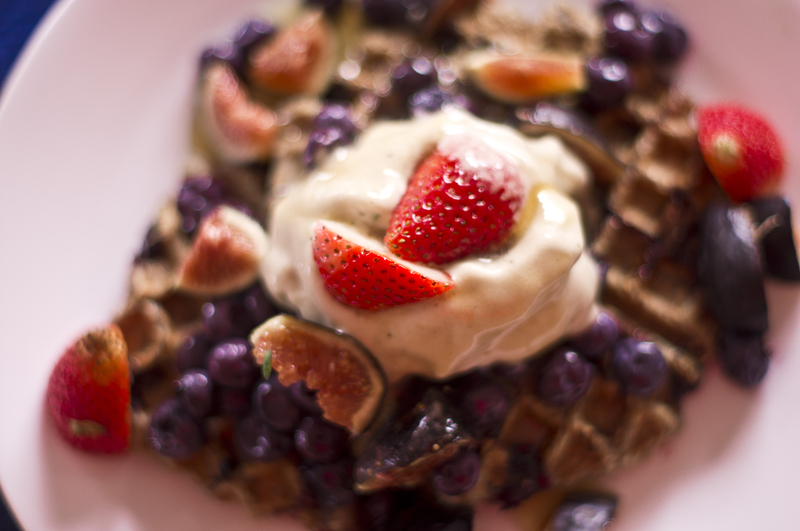 Combine all cream ingredients in a food processor or high speed blender. Blend until consistent and creamy mixture forms. Spread creamy mixture on top of your crust base. 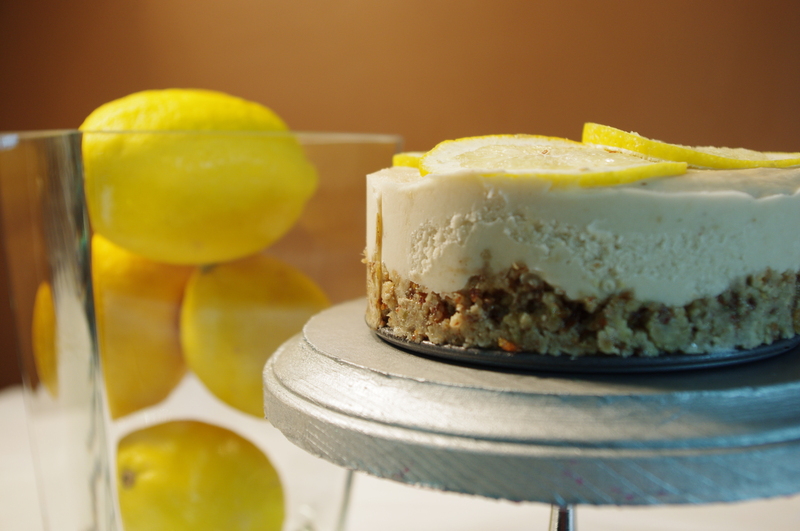 Place lemon slices on top of cream. Place in freezer for 2-3 hours. Take out of freezer 20 minutes before consuming.